Day of rest. Went to church. We had a fast and testimony meeting. Then I substituted in Sunbeams, the class that William attends. A.M. Did a workout. 2x3 miles. First one up on the usual course, the second one down. On the up one I thought for sure I would be over 6:00 on the last mile after running the first one in 5:54 with significant effort followed by 5:59, and two less than spectacular quarters in 92. But then I stopped the bleeding somewhat with a 91 quarter, and then shifted gears and ran the last one which gives you a short break from the uphill in 85, so 6:00 for the last mile and 17:53.9 for 3. Then I had a rather long break - about 1.4 miles of jogging + a bathroom visit, this was not a VPB, there is an actual bathroom at Nunn's, and I headed for the last one. I set a goal to beat Benjamin's record of 16:26, which is easy for me fresh, but after running the first one uphill hard this was going to be a challenge. 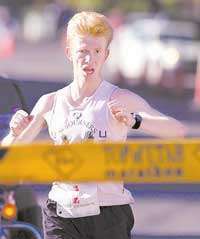 My first mile was 5:24, then 5:28, and in the last mile I shifted gears and ran 5:16,which gave me 16:08 for 3 miles. Total mileage was 12. Benjamin ran 3. Everybody else rested for the cross-country race in the evening. P.M. Cross-country meet. It was windy so the times were slower. Not sure exactly how much, but I am estimating somewhere around 15-20 seconds. Maybe more. Benjamin ran 10:55 taking second place after Thomas Heaps who ran 10:45. Good for him to learn humility and also for us to discover something to work on. He got gapped early in the race, but then the gap did not grow. We had a conversation about it. He said he just could not go with the pace. I argued that he could. My argument was that Thomas did not run 9:50, or even 10:20 if we gave him a generous allowance for the wind. So Benjamin given his 4:55 1500 performance could have stayed with him at least to half-way if he just ran without thinking how much longer he had left. We are going to work more on faith running. I am thinking a 3 mile tempo run down the canyon where I hit 5:20 as close as I can, and his job is to run with the pace "till the standard bearer fainteth". Joseph got beat in Sub-bantams for the first time this year as well. I told him to attach himself to John Hunter, Iain Hunter's son. John is a Bantam, but still I wanted Joseph to be in contact with him so he would be safe from his Sub-Bantam competition which I suspected might be closer to Joseph that he thought. But Joseph was doing his own thing running most of the race alone a few seconds behind John. All of that after a lengthy pre-race instruction about the benefits of drafting in windy conditions. Well, kids sometimes do their own thing, and then find out why it was a bad idea, which is what happened to Joseph. He got caught in the final stretch by Ammon Blackburn, his nemesis from the last year, who Joseph has been beating this year without problems, but Ammon got into better shape for this race. Joseph fought, but he turned on his kick too late, and even though he leaned, Ammon ended up winning the visual pseudo-photofinish. They both got 14:27, but Ammon was declared the winner. I told Joseph we were going to work on learning to main contact regardless of how fast he thinks his competitor is running. Jenny and Julia had good races. Jenny got 14:51, and Julia broke 15:00 in cross-country 3 K for the first time with 14:53. Jacob, the obedient child, reaped the fruit of his obedience. I told him to go with Joseph and stay in contact until he absolutely could not. The idea was to knock him out of the rut of just running a somewhat comfortable pace regardless of the distance. He was rewarded with a fast time - 15:11, and third place in the sub-Bantam's only 45 seconds behind the winner in spite of being 2 years younger. His official time was 15:16, but it is a mistake - I timed him at 15:11. Later I ran 0.5 with William. A.M. Total of 12. 7 with Benjamin. 1 with Jacob. 2 with Joseph, 2 with Jenny, and Julia. A.M. 12 total. 0.5 with William in 4:36, 1 with Jacob, 2 with Joseph, Jenny and Julia did 3, Benjamin 7. I did some pickups including 1000 in 3:10 down the canyon with Benjamin. A.M. 12 total. All with the kids. Joseph did 2, Jacob 1, Jenny and Julia 3, Benjamin 7. William was sick and did not run. I did some pickups. A.M. 20 mile run. Ran with the kids first. Jacob did 1, Joseph 2, Jenny and Julia 3. Then I ran with Benjamin. He did 7. We did 1.5 down the canyon to teach him how to deal with a competitor that is running strong and pushing the pace into the miserable range. The target was 5:20 pace, so 8:00 for 1.5, but he was acting edgy on my shoulder so I thought he wanted to go faster. So we did 79, 77, 78, 79 - 5:13 for the mile. At that point he began to beg for mercy saying: "Daddy, please do not speed up". I told Sarah about this later, she said - "isn't that cute that you have a boy that can run a 5:13 mile and keep going that still calls you Daddy?". I was going to tell him that he could not ask his competitors to do that in a race, but the pace was hard for me as well, I could not say that much. So I eased off to a 1:02 300 (did not mean to ease off that much), and then we kicked, sort of, and finished in 7:52.7. This was a good learing experience for Benjamin. After we finished, we parted ways - he ran home, and I ran for more miles up the canyon. On the way back I ran a 5 mile tempo. I thought it would be easy to maintain 5:40 given how easy the 7:52 1.5 came to me. But it was not so. The first 0.5 or so was easy, and after that it got progressively harder. I still managed sub-5:40 pace going out of the canyon for 3 miles, but once I hit the uphill at the end I was barely breaking 6:00. My time for 5 miles was 28:44 - 5:44.8 average. I felt that the heart was tired and underperformed, so I took measures when I got home - a nap, also got some avocados and almonds at Costco.